how to celebrate merdeka day… – welcome! … when i’m constantly told to ‘balik cina’ (go back to china). … when a malay daily that starts with U and belongs to a party that starts with U, constantly get away with spewing racial and seditious remarks? … when we still have so many oppressive laws like ISA, OSA, PPPA, UUCA, sedition act and so on. … when we have people who take it upon themselves to defend the king and yes, defend god too. … when we can have malay extremist groups, spewing out whatever seditious remarks or hurling accusations at non malays and the govt did nothing BUT if there is a non malay extremist just squeaking away, those malay groups will attack him and the govt and police will quick jump into action. … when my country only knows how to play racial politics and nothing else? the economy, healthcare, education, the poor and many more important issues are ignore but it is always racial, racial, racial. remember we have a DPM who is a downright racist when he had declared he is malay first, malaysian last. so what merdeka, you tell me? lots more to add on to the list, which will made you feel more down and therefore think of nothing at all to celebrate our independence day. nothing. 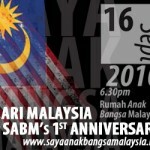 One Response to "how to celebrate merdeka day…"
For a change may be this year you can consider giving more time to Hari Malaysia on Sept 16th! There will be a Hari Malaysia performance by 4 Belaga Sape group performers coming to Penang (Sept 15th) and KL(Sept 16th) to do a people-to-people celebration! More info later. Bring all your friends!